The bleachers were packed, adrenaline was in the air, and analytics were favorable for an upset as the Demon Deacons were looking for a program-defining victory. Instead, they were handed a cruel dose of reality by the Irish. Wake Forest was seeking its first top 10 upset since beating Tennessee away in 1946. It sure looked like a real possibility with the spread showing the Fighting Irish favored only by 6.5 points. In comparison, last year’s matchup against Clemson, also top 10 at the time, had the spread favoring the Tigers by 23 points. It sure looked like a somewhat balanced matchup on paper, and at least during the first half the predictions looked right. The Fighting Irish’s first few offensive drives were completely nullified, as the Demon Deacons showed great downfield coverage. The first three possessions for Notre Dame resulted in one punt and two turnovers. In one of the turnovers, safety freshman Nasir Greer popped the ball loose from the hands of WR Michael Young for a Notre Dame fumble recovered by Wake Forest LB frehsman Ryan Smenda Jr. and returned all the way to the Irish 30-yard line. Yet Wake Forest couldn’t capitalize on the turnover and had to settle for a field goal. Settling for the field goal was the common theme of Wake Forest’s offense through the first half. The team would move the ball well, sustaining long drives, but would get stifled in the red zone by a powerful Notre Dame defense. On the other hand, the Fighting Irish finally established a rhythm on offense making the most out of their opportunities with touchdowns drives in five straight possessions. Wake Forest’s recurring defensive problems were coming back to haunt them once again. Yet, despite the defensive miscues, the Demon Deacons managed to get the ball with less than two minutes remaining in the first half. They had the opportunity to reduce the Irish 28-13 lead to a one-possession game. Wake Forest then marched downfield with a passing game that was missing for most of the game. The Wake Forest team that everyone on the stands came to watch was finally showing up. The team that put Notre Dame on upset alert was finally gaining some traction. It looked like a game-changing drive as the momentum started to shift in favor of the Deacs. Wake Forest managed to set up a field goal attempt with two seconds remaining on the half and put some much-needed points on the board. Instead, freshman Nick Sciba’s kick exploded against the left upright and died out by the 10-yard line alongside the voices of thousands of Wake Forest fans. Sciba finished the game with two field goal misses in four attempts. What was supposed to be a game-changing play for the Deacs became the tipping point for The Fighting Irish win. Following that play was an endless sequence of scoring drives by the Notre Dame offense that increased its lead to 49-13 in the third quarter. Freshman Sam Hartman was smothered for most of the game by an extremely disruptive Notre Dame defensive line. Hartman finished the game with 110 yards completing 12 out of 24 attempts and being sacked three times. The true freshman QB was carted off the field midway through the third quarter, but it looked like it was only cramping issues and the QB was held out of the game for cautionary reasons. Also carted off the game were freshman LB Ryan Smenda Jr. and redshirt senior OL Phil Haynes. Both are key contributors to the team and a long-term loss would be a tough blow to positions already plagued with injuries. On the other hand, Notre Dame’s QB Ian Book finished the game with 325 yards and a pair of touchdowns, while completing 25 out of 34 passes. All were career-highs for Book. This was also the first time in the season that Notre Dame scored more than 24 points. In the aftermath of the match, Clawson announced on Sunday, Sept. 23th, that Defensive Coordinator Jay Sawvel had been effectively relieved of his duties. Wake Forest allowed a total of 566 yards against Notre Dame, marking the fourth time the team has surrendered 400+ yards in as many games this season. Wake Forest’s defensive unit is currently ranked 113th in the country in total defense while allowing a staggering 484 yards per game this season. “You don’t make a decision like [firing your defensive coordinator] after one game, two games, or a month. This has been an evaluation of the last year and a half. I have evaluated our defense and I don’t feel it was up to the standard,” said Clawson at Tuesday’s press conference. 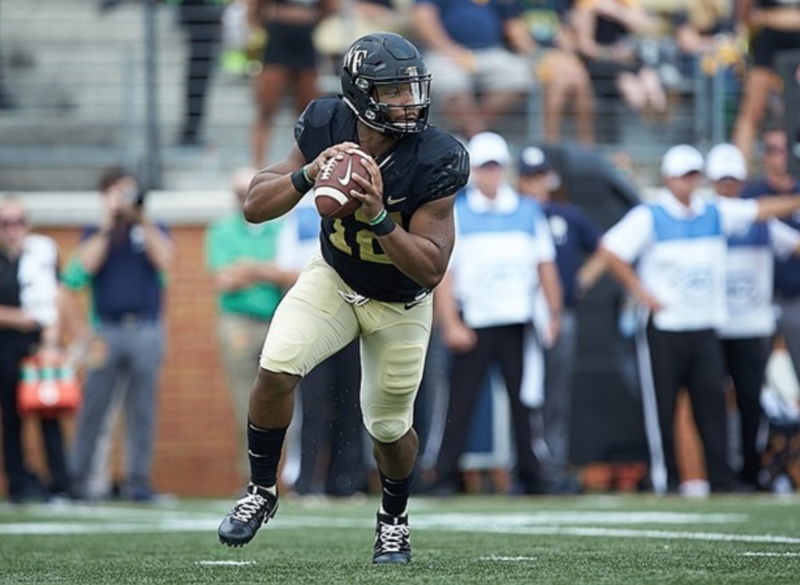 Now, the Demon Deacons will look to bounce back at home in a matchup against the Rice Owls. Rice is 1-3 in the season with losses to Hawaii, Southern Mississipi, and Houston. The game will be played on Saturday, Sept. 29 at BB&T Field at 3:30 pm.